Once more jugglers had the opportunity to meet and have a very nice week-end in a town of Switzerland, a suburb of Geneva. The location had a place outside and a big juggling hall. The hall was separated in two such that we could sleep in the smallest part. Three sellers (Henrys, Babach and jonglerie contact) were in an upper place, near the entrances of the gym. The weather was excellent, except for Sunday from 9 am to 12 am. As usual, the convention was quiet, many people juggled, but others just took a good time. From the participant point of view, the convention was very nice, with many workshops, many opportunities to exchange skills and the public show was great. 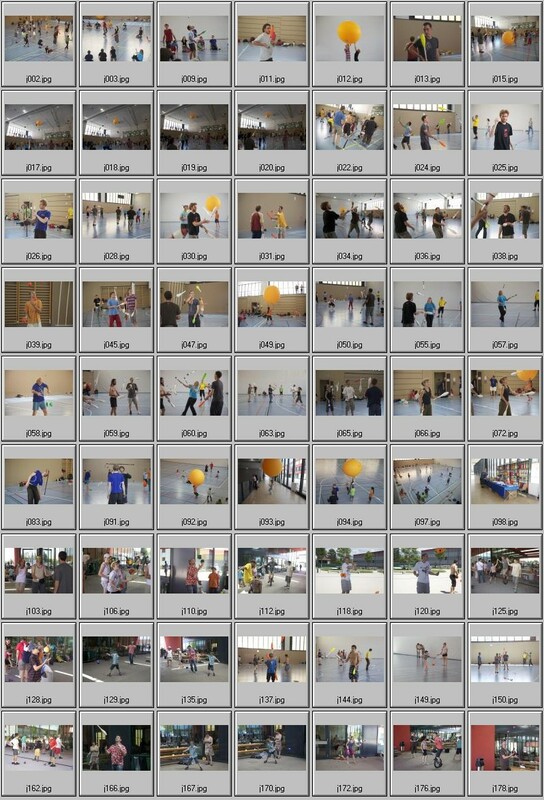 The games were a nice moment too, with the participation of nearly every juggler. We heard many nice comments. From the organizers point of view, we were a little disappointed having twice less participants than expected. Maybe the date, at the beginning of the holidays was not adequate or is Geneva too far for most Swiss jugglers ? Thank you to the city of Plan-les-Ouates for helping us to organise this convention and for the nice place put at our disposal. Reference to their web site describing this convention. Here are some photos of the show taken by : Maurizio Giuliani, a photographer. Thank you for all these nices photos. Here are other photos taken Sunday by Maurizio Giuliani, during the end of the games and after. Thank you for all these nices photos. Please tell me the mistakes I made, in order to help me to maintain a correct page. If you know names of peoples on the photos, please send-me an e-mail with their names and the corresponding photos.